Roger Dubuis was the brand at SIHH with the booth that was the talk of the town. 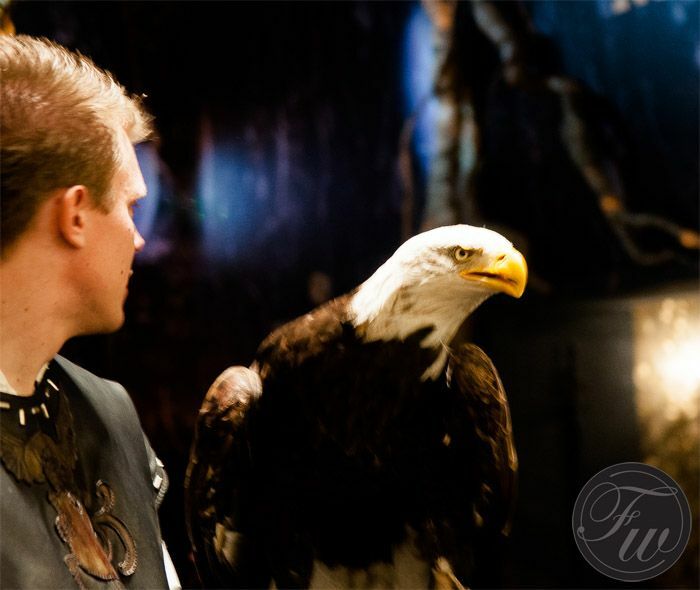 Not because of their watches in the first place, but because of the incredible large gold eagle and the live American eagle they had on their booth. Roger Dubuis definitely knows how to draw attention. But what about their watches? 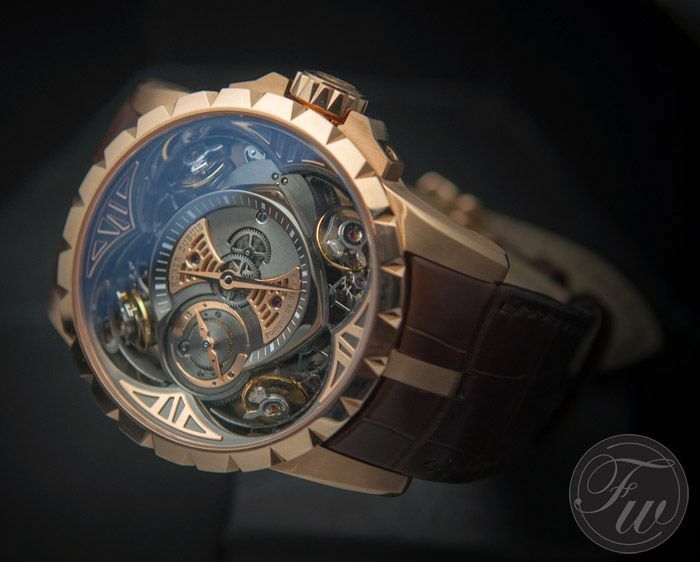 You’ve probably seen the Roger Dubuis Excalibur Automatic Limited Edition (ref. RDDBEX0398) where the dial is a round table with 12 knights as hour markers. What about their other SIHH 2013 novelties? We zoom in on the Roger Dubuis Excalibur Quatuor (reference RDDBEX0367) that was presented to us during the SIHH 2013 exhibition in January. In all honesty, I have seen the huge Roger Dubuis factory just outside Geneva and I always wondered where their watches go. If you have a factory that big, at least you should be able to spot a few in the flesh or name at least one of your friends who has one. I was told that Roger Dubuis is especially strong in Asia and another aspect that answered my question is that Roger Dubuis does a lot of technical research & development for other Richemont brands. Roger Dubuis is to Richemont what Renaud & Papi is for Audemars Piguet. 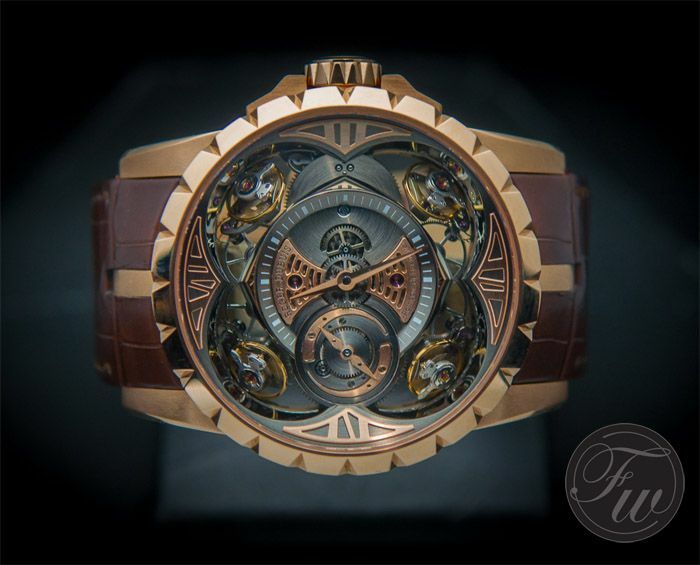 One of Roger Dubuis technical highlights presented to us this year, is the Excalibur Quatuor. On first sight, it looks kind of odd. A skeletonized dial with four balance wheels that are under an angle of 45 degrees. What Roger Dubuis did here, is create a watch that fights gravity like a tourbillon without actually being a tourbillon. 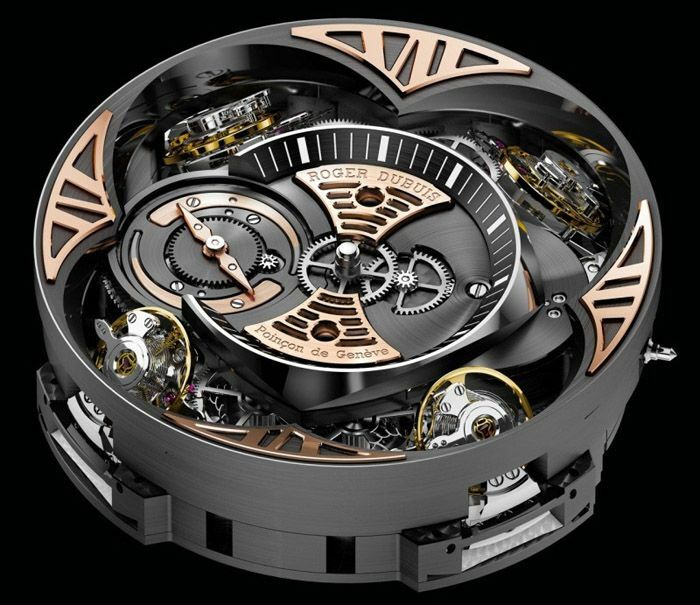 They also claim that this new innovative method fights gravity ‘real time’ instead of the 60 seconds it takes for a tourbillon to make a stand against gravity. In short – when a watch changes position, the accuracy rate (might) drop(s) due to the gravity the balance experiences. The Roger Dubuis caliber RD101 movement has four balances that work in pairs (of 2) to immediately compensate for the changing position of the watch. This 4x 4Hz movement, as Roger Dubuis refers to it, should be super accurate because of all the compensating it performs when wearing the watch. Whether this watch is wearable depends on the buyer of course. Fact is, that this watch is quite large with its 48mm diameter and the gold version I handled weighs quite a bit. Although I am a fairly large guy, I thought this watch is a bit too big for me. At least for every day wear. Aside from the pricing of this Roger Dubuis Excalibur Quatuor, I don’t think many buyers will actually wear it. It is a master piece from the hands of many Roger Dubuis watch makers, technicians and designers, just to demonstrate what they are capable of. I am convinced that there will be people who are going to buy this watch, for whatever reason, but if it was up to me, I would stick to the Excalibur Chronograph (more about these in a separate blog post) or the more elegant Monegasque. On the other hand, I think it is cool that Roger Dubuis actually puts a watch like this in the market. Where many other brands would just create a one off to demonstrate their watchmaking skills, Roger Dubuis puts it on the market for those who really want to have one (and can afford one). The caliber RD101 movement consist of 590 parts and has been entirely developed and produced in-house at Roger Dubuis. The Roger Dubuis RD101 movement is being used in the Excalibur Quatuor as pictured above, limited to 88 pieces, and in the Excalibur Quatuor in Silicon (reference RDDBEX0408), limited to 3 pieces only. These watches measure 48mm in diameter and have a power reserve of 40 hours. The price of the Roger Dubuis Excalibur Quatuor edition in gold is approx. CHF380,000 Swiss Francs and the very limited silicon version is approx. CHF1,000,000 Swiss Francs.